A 19-year-old Palestinian asylum seeker from Syria turned himself in to German police Thursday after his violent anti-Semitic attack on an Arab Israeli man wearing a Jewish skullcap in Berlin caused outrage across Germany. Police said the suspect they had already identified from the footage and witness statements had presented himself with a lawyer and would face a judge to be held on assault charges. Bild daily identified him as a Palestinian from Syria named Knaan S. who was registered at a refugee home in Brandenburg state outside Berlin but was most recently living “out of a suitcase” in the capital. The victim, initially thought to be Jewish, told German television on Wednesday night that he wasn’t, but wanted to find out whether it was safe to walk in the street dressed as a Jew. He said he wore the skullcap as an experiment because he didn’t believe a friend who told him it’s too dangerous to wear one in public in Germany. Justice Minister Katarina Barley condemned the incident as a “disgrace” for German democracy after the brief video surfaced on news websites and went viral. “It is unbearable that Jews in Germany are attacked on the open street in the middle of Berlin,” Barley tweeted. Foreign Minister Heiko Maas said Germany “bears a responsibility to protect Jewish life” more than 70 years after the end of the Holocaust in which the Nazis murdered six million Jews. 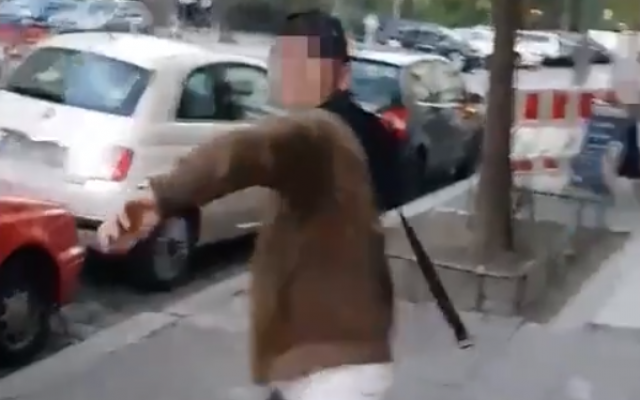 The two men in their early 20s, wearing skullcaps known as kippas, were accosted at the Helmholtzplatz, a public park in the Prenzlauer Berg district of the capital by three young men, at least one of whom spoke Arabic and has been reported to be Muslim. 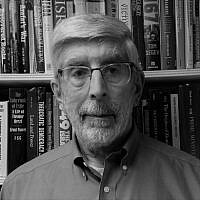 Armush filmed one of them men whipping him with a belt while calling out, “Yahudi,” or “Jew” in Arabic, before he is stopped by a passerby. The video subsequently shows Adam with a bruise on his torso. “I am very sad but at the same time I’m happy that we were able to achieve something with the video,” he said, speaking fluent German. “I am a little afraid now, and disappointed,” he said, adding that he nevertheless planned to continue wearing the kippa in Berlin. Israel’s Kan public broadcaster located Armush and interviewed him in Hebrew near his home in Prenzlauer Berg. “It happened right here, next to my home, when I was on my way to the train station with my friend,” Armush told the network. “The truth is, I’m surprised something like this happened to me. I’m still in shock. “This case must be met with the full force of the law,” he said. A number of high-profile incidents in recent months have raised alarm bells about a possible resurgence of anti-Semitism in Germany from both the far-right and a large influx of predominantly Muslim asylum seekers since 2015. 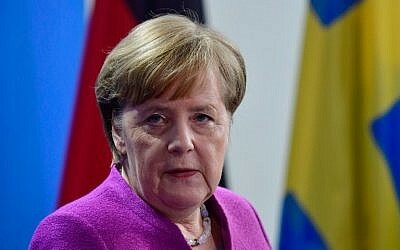 Merkel created a new position of commissioner to fight anti-Semitism under her new coalition government sworn in last month. The RIAS group that tracks discrimination of Jews said Berlin last year had 947 anti-Semitic incidents, including 18 attacks and 23 threats. 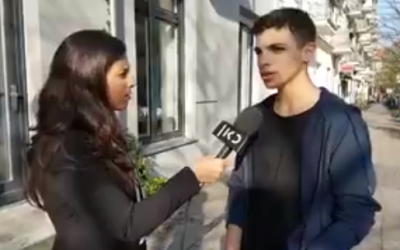 Several Jewish students have reported anti-Semitic bullying in schools in recent months and Israeli flags were burnt during a recent protest in Berlin.